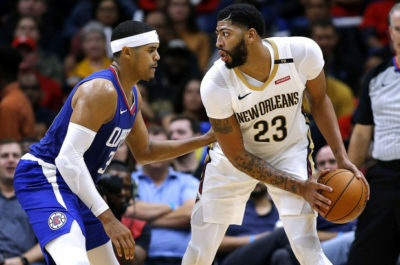 The Lakers couldn’t find a way to find an agreement with NOP to welcome Anthony Davis. Yet, other teams, above all the Bucks or the Sixers traded well and will be even more legit contenders for the NBA title. Let’s take a look at the ten best moves before discussing AD potential move. With Simmons’ non shooting from three and Embiid shooting only 30%, Philly lacked a real threat at PF and have found the best fit without sacrificing much. With 21.9pts per game on 43% 3pt and almost five attempts, Harris is an efficient scorer who isn’t a ball hog. He will take what his teammates give him and makes up for Simmons inability to shoot from outside. He’s also a smart player and respected locker room guy who at 26 still has room to be better. He’s an unrestricted FA by the end of the year so if he helps the Sixers reach the Finals or win it, he will ask for a big check. As if the Bucks were not good enough, they have just added one of the best shooting big of the League. Mirotic has not been his best self this year with multiple injuries and inconsistent shooting. Yet, his 16.7pts and 8.3rbds on 37% 3pt will create lines for Giannis to drive and a solid shooting frontcourt with Lopez. The Bucks have just lost recently traded Stanley Johnson (basically Thon Maker) and Jason Smith, peanuts compared to what Mirotic can bring for the contending Bucks. Cuban took a gamble on this one as Porzingis has not come back from injury and will not play this year. Dallas has given up Smith Jr, Jordan and two future first round picks. The Mavs hope to fall and keep their pick. They also take the risk to lose their pick to Atlanta and that Porzingis doesn’t come back as bouncy as he was. If he comes back healthy, he’s the perfect fit alongside Luka and the other potential free agents who may sign this summer. All in!! That’s what the Raptors may have thought when they were offered the opportunity to add the younger Gasol to their roster. Year by year, Gasol has gone away from the rim, shooting one third of his shots from three this year for a decent but not exceptional 34%. The Raptors may ask him to stay more in the paint and use his high basketball IQ to create easy basket for his teammates. the fomer Grizzly has a 25m option at the end of the year he will probably activate as he’s nearing the end of his career. The Wizards had been criticized a lot for the sizzling contract they gave to Porter Jr, a pure glue guy (12.2pts 5.6rbds 1.5st 38% 3pt) who brings shooting and defense to the table. The Bulls needed a SF badly and Porter fits perfectly. Concerning his contract, as the Bulls only have Lavine on a heavy but pretty reasonable contract (19m a year until 2022) while Markannen, Carter Jr or Dunn will earn less than 5m, Porter’s contract is less of a problem. With a potential top 5 pick in the next draft, the Bulls could have one of the most talented, albeit young, starting five in the League in which Porter could become the leader by example. Memphis turns the aging Gasol into the 26yo Valanciunas and some valuable swingmen. Of course, Jonas may never get that bball IQ which makes Gasol a special center, yet, at age 26, Valanciunas is a very solid center who has always made the best of the limited minutes he got (12.8pts 7.2rbds in 19min with the Raptors). Valanciunas will be the focus inside and pairs well with JJJ. Wright and Miles respectively bring their versatility and shooting with light contracts. The Kings keep doing a very nice job of asssembling a solid roster for the future. They were playing with a three-guard line up and Justin Jackson was the only real forward with minutes. By dealing Jackson and Randolph for HB, the Kings have finally that SF they needed so much and somebody they will try to keep for the future. Barnes has been somewhat disappointing with 17.7pts but on a low 40% FG including a better 39% from three. He could use this new environment to prove he can be much better and help Sac Town reach the playoffs. The Wizards found a way to get rid of Porter’s contract for Parker’s expiring contract and Bobby Portis. Despite starting only 27 games in Chicago, Portis (14.1pts 7.3rnbds 37% 3pt) has proved he could be a legit starter and has expanded his game as a modern PF. He’s willing now to prove he deserves a nice contract by the end of the year. Parker (14.3pts 6.2rbds ) will never live up to the hype he was worth in high school. He will use the remaining games to sign a multiple year contract at the end of the season. The Knicks were criticized so bad for drafting Ntilikina instead of Smith Jr that they decided to trade for the former Wolfpacks. They gave up much by sending their franchise player Porzingis to Dallas but with a potential first pick and still valuable assets like Ntilikina or Robinson, they may try to trade for Davis or built a better team (could it be otherwise?) for the future. They will also get future, albeit not immediate, first round picks and will have cap space as Jordan is on an expiring contract. A big gamble but which could turn out good if Smith Jr performs well. Fultz has been in a weird position, bothered by unusual injuries. Only 21, it would be nice if Fultz could at least play a full season. Orlando didn’t give up much with Simmons and a future OKC first rounder. If somehow the former number one pick was able to play, he would be another option at G. Nobody doubts the talent he displayed at Washington. Hopefully, the Magic could benefit from it ASAP. What is an AD worth? After claiming his intention not to sign an extension and thus to be traded, Davis waited until the last days before the trade deadline to let his preferences be known, sweeping away Boston and listing the Lakers, Clippers, Bucks and Knicks as his preferred destinations. That won’t prevent NOP to trade Davis to Boston, which may have the best to offer with Brown, Tatum, Irving, Hayward or Rozier and multiple draft picks as potential parts of the package as there is no no-trade clause in Davis’ contract. The Bucks have also been listed but it’s difficult to see which package they could build without any star prospect in the roster (we won’t even put Giannis in the conversation). The Clippers have less to offer than their neighbours so, like Milwaukee, it’s hard to envision a trade there this summer. Among the probable suitors, the Lakers have a legit chance to land the Pel forward with numerous young talents like Ball, Ingram and Kuzma and also picks to use. NOP may be afraid that none of them turns into a franchise player as they have shown limits to their potential. Last but not least, the Knicks. After trading their former future with Porzingis, New York is hopeful to land the first pick of the 2019 NBA draft. If that’s the case, the prized recruit will probably be Zion Williamson. This could help the Knicks build a solid package with Zion, but also potentially New Orleans’ own Mitchell Robinson, the surprising rim protector rookie with untapped potential and another potential solid prospect with Ntilikina, who has been at least misused by Fitzdale. Which direction NOP will go? We need to wait some more months to know the end of the story.